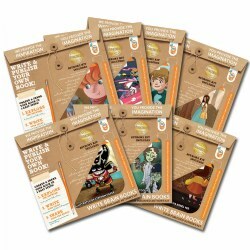 Reinforce literacy skills with workbooks and lessons specifically designed with certain grade levels in mind. 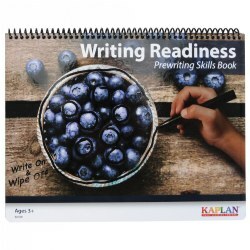 Kaplan offers practice cards, activities, charts, writing wheels, and more. 3 years & up. 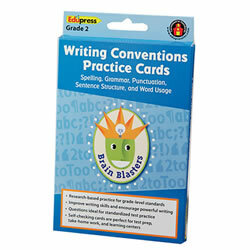 Support fine motor skills as you introduce beginning writers to eight basic writing skills in a fun and engaging way. Real images encourage children to establish familiarity with the strokes necessary for early letter formation. 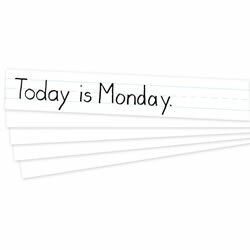 The 16 double-sided thick and sturdy dry-erase pages are bound at the top to allow for easy flipping and accommodates both right- and left-handed writers. Eraser and dry-erase pen are sold separately. Grades K & up. Features 18 research-based graphic organizers that encourge analysis, evaluation and synthesis according to Bloom's Taxonomy. 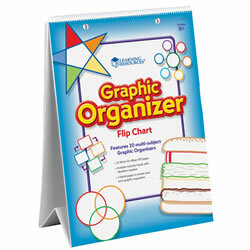 Includes 24-page activity book with blackline masters and how to examples of each organizer. 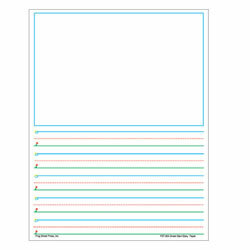 Spiral-bound chart with 10 double-sided, write & wipe pages (including two blank pages for customization). Measures 14 1/2"L x 20"H.
Printed on sturdy tagboard that performs well with inks, pencils, and crayons. Ruled 1.5" with .75" dotted midline on one side, and a single line ruled on the opposite side. 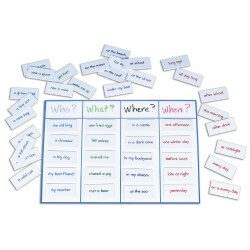 Use for teaching basic skills, word wall activities, tags, and more! 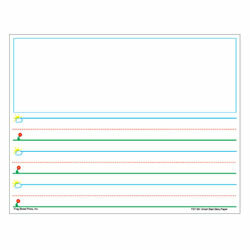 Set of 100 white sentence strips measure 3" x 24" each. 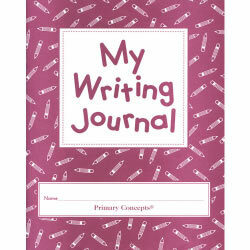 Create your own personal book with these 30-page journals. 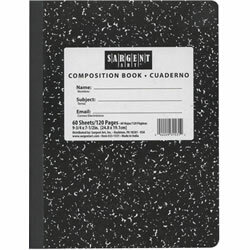 My Writing Journal has lines for writing, plus space for a drawing and includes a word bank for frequently misspelled words. 20 book set. Grades K - 1. A great learn-to-write series based on the Sky to Ground™ concept for handwriting. Bold graphics and color coded lines in blue, green, and red allow children to quickly understand the concepts of lines and space. 1" spacing. 8 1/2" x 11", 360 sheets per pack. Grades 1 - 2. A great learn-to-write series based on the Sky to Ground™ concept for handwriting. Bold graphics and color coded lines in blue, green, and red allow children to quickly understand the concepts of lines and space. Large space for illustrations with 5/8" spacing. 8 1/2" x 11". 360 sheets. Grades K - 2. 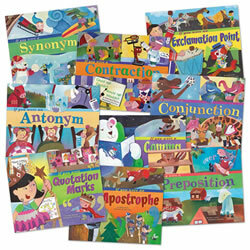 Enhance early grammar and reading skills with sturdy, interlocking cards that cover parts of speech, capital letters, punctuation, building sentences, and more. Tailor activities to different learning levels. Includes grammatically color-coded cards (55 word, 4 punctuation, and 27 photo cards), game ideas, sample sentences, and teaching suggestions. Supports NCTE and NAEYC standards. Grades 1 & up. 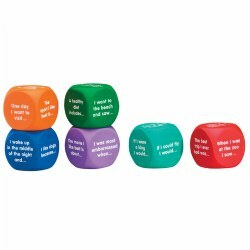 Spark brainstorming and imagination with these writing prompt cubes. Students can use cubes in both creative storytelling and nonfiction writing activities. With different writing prompts on each side (36 prompts total), foam cubes offer a variety of ideas for individual or group writing projects. Cubes wipe clean and are quiet when rolled--perfect for centers. Activity guide included. Cubes measure 1 5/8". 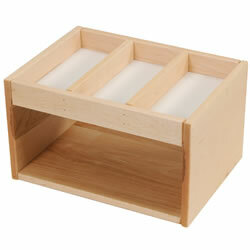 Keep whiteboard supplies organized with this lightweight wooden caddy. Small enough to place on a table or desk. 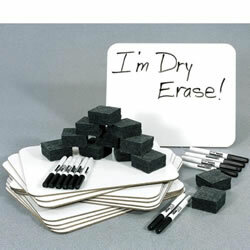 Provides easy access to twelve 9" x 12" lapboards, markers and erasers. Supplies not included. Fully assembled. Hard cover composition books. Measures 9 3/4" x 7 1/2". Set of 5 with 100 pages each. Grades K & up. 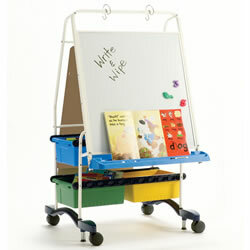 These marker board sets are perfect for reading or writing centers. Each set contain 9"x12" marker boards, markers and erasers for 12 students. Made in the USA. Grades 3 & up. Teach 10 essential rules of grammar usage and mechanics. 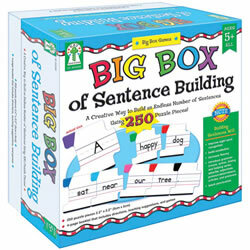 Set includes ten 16-page storybooks,120 page teaching guide and sturdy storage box. 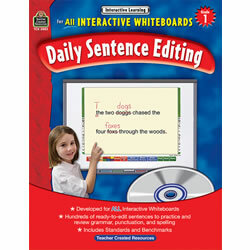 A great learn-to-write series based on the Sky to Ground™ concept for handwriting. Bold graphics and color coded lines in blue, green, and red allow children to quickly understand the concepts of lines and space. Large space for illustrations with 1" spacing. 8 1/2" x 11". 360 sheets. Grades K & up. Improve sight word recognition, increase fluency, and introduce grammar with this set of puzzle pieces, each color-coded by part of speech. The set of 250 puzzle pieces (approx. 2" x 2") also includes four blank puzzle pieces and a four-page booklet with directions, teaching suggestions, and games. Supports NCTE standards. Grades 1 - 3. Build a variety of sentences that answer four basic questions: Who? What? Where? And when? 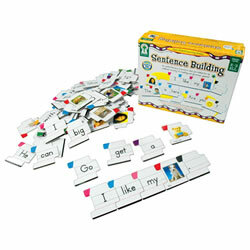 Color coded tiles make complete sentences easy to build. Great story starters to help children explain how or why, and what happens next. Set includes 60 tiles plus teaching notes. Take the mystery out of Bloom's Taxonomy with Quick Flip Questions for Critical Thinking. Learn how to ask questions, lead discussions, and plan lessons geared to each level of critical thinking. 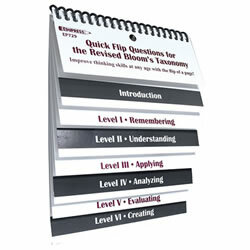 This hand-held flip chart helps improve thinking skills at any age. 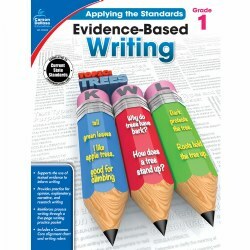 Teachers, parents, and students alike will find this an indispensable tool for improving communication, enhancing verbal skills, developing questioning skills, facilitating report writing, and developing higher levels of thinking. Grades 2 - 5. No more tedious worksheets! 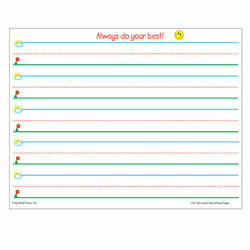 These double-sided, self-checking cards make skill practice easy and accessible. An excellent source for parent involvement. Questions cover spelling, grammar, punctuation, sentence structure and word usage. 240 practice questions per set. Grades 1 - 5. 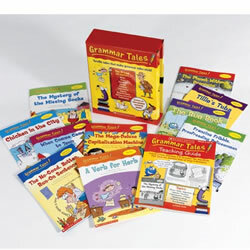 Use these fully interactive products to teach students important skills in grammar, punctuation, and spelling. The activities are fun, but they aren't gimmicks; they're based on standards and benchmarks. Includes 180 sentences that need to be edited. And if that's not enough, the program allows thousands of custom sentences and paragraphs to be created and saved! Compatible with all brands of whiteboards. Grades 2 - 4. Adjectives, adverbs, nouns, verbs -- which part of speech would you want to be/ Life as a word can be wild and a lot of work. Discover how these lexicons live and how they help build sentences. 10 books with 24 pages each. 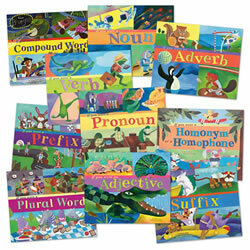 Includes: If You Were a Noun, If You Were a Verb, If You Were an Adjective, If You Were an Adverb, If You Were an Adverb, If You Were a Pronoun, If You Were a Homonym or a Homophone, If you Were a Compound Word, If You Were a Prefix, If You Were a Suffix, and If You Were a Plural Word. Grades 2 - 4. Adjectives, adverbs, nouns, verbs -- which part of speech would you want to be/ Life as a word can be wild and a lot of work. Discover how these lixicons live and how they help build sentences. 9 books with 24 pages each. Includes: If You Were an Antonym, If You Were a Conjunction, If You Were a Preposition, If You Were a Synonym, If You Were a Contraction, If You Were an Apostrophe, If You Were a Comma, If You Were an Exclamation Point, and If You Were Quotation Marks.